Dege & Skinner have never been ones to blow their own trumpet. 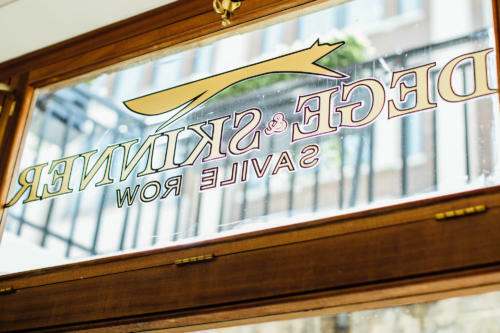 But in the past couple of years there have been small signs of the 150-year-old, family-run tailor stepping out. In 2012 they took over the workrooms under the shop on Savile Row, allowing them to move far more people on site. Last year there were some lovely celebrations for their century-and-a-half anniversary. And last month they began offering ready-to-wear suiting for the first time. 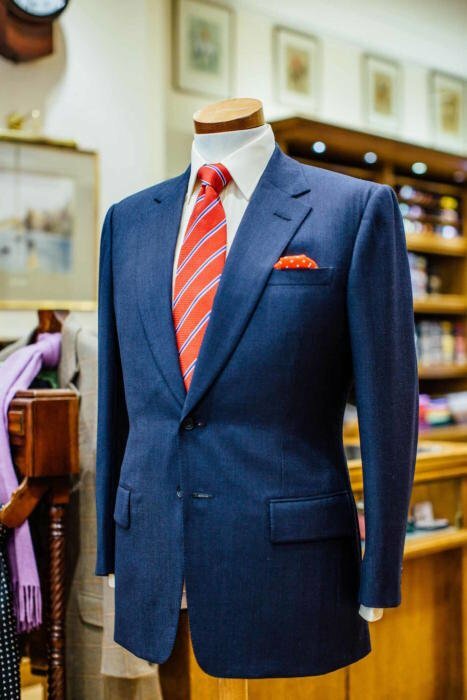 There is a pretty conservative selection of navy and grey suits, and navy blazers, starting at £995. They are half canvassed and made by Wensum in Mauritius. “It is certainly our style - we tweaked the shape and moved the buttons and pockets a touch,” says Cowley. 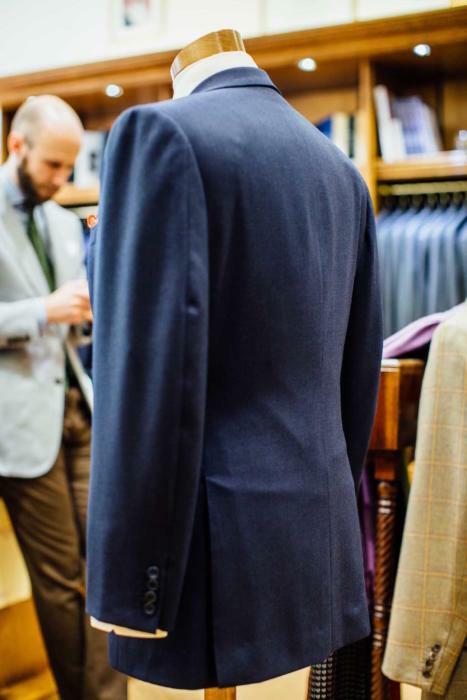 “Plus we do all the alterations in-house, so you get that tailoring expertise.” For me, that last point is probably the most significant. It is a fairly strong-shouldered, structured look, similar to other Savile Row tailors like Huntsman and Richard Anderson. They don’t do many one-button jackets though, unlike those houses, preferring to keep it for dinner suits. Most single-breasted jackets are two button, with a ‘true’ (no roll) three button for more casual, country pieces. Not much drape in the chest, and not much flare to the skirt. The lapel(3.5 inches in the image above) has a touch of belly. There is little rope to the shoulder. And the cuffs normally have two working and two show buttonholes. Dege’s overall look is clean and close, much influenced by the range of military tailoring the house does (which all the cutters are trained in). 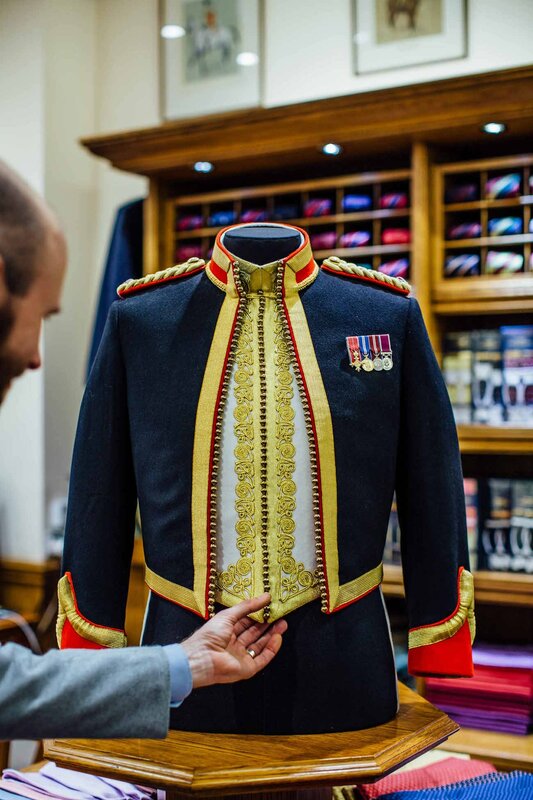 That military tailoring is everywhere around the shop. It catches the eye on the dummies, and jumps out when you start looking through the racks of fittings waiting downstairs. 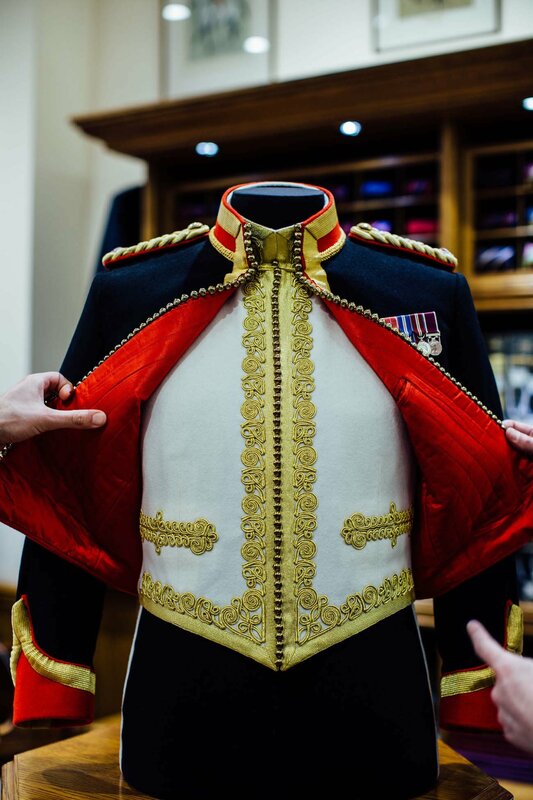 There’s the mess dress of the Royal Lancers above, with its beautiful embroidery and cape-like jacket. 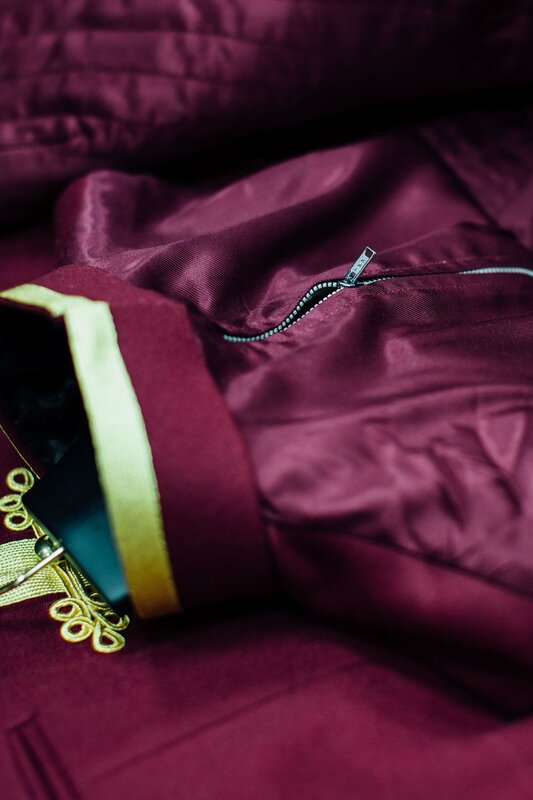 Those buttons down the front are used to disguise a zip - if you see one without those, the piece has to be slipped over the head and zipped up at the side or back instead. This piece was actually designed by Dege & Skinner for a new cavalry regiment. As the number of cavalry units decreases, more and more are being merged, and they then require a new dress uniform that brings in aspects of each’s traditional dress. “They didn’t mind that much about most aspects of the design, but they really wanted to keep the waistcoat. 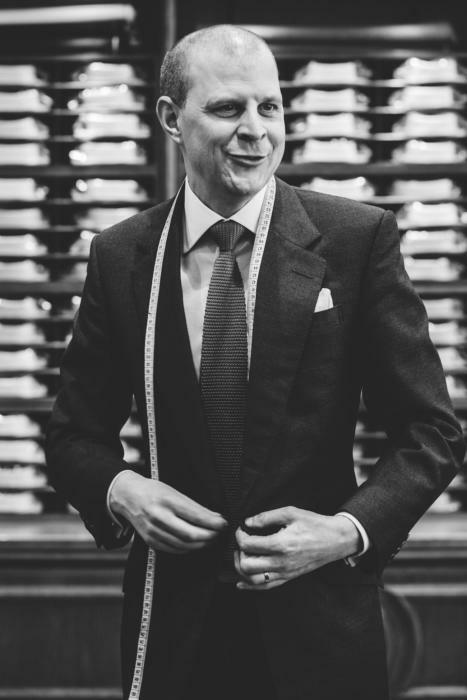 That was the thing that defined their dress uniform for them,” says senior bespoke cutter Nicholas De'Ath (below). I think I’ll do a separate post at some point trawling these uniforms for little points of inspiration. 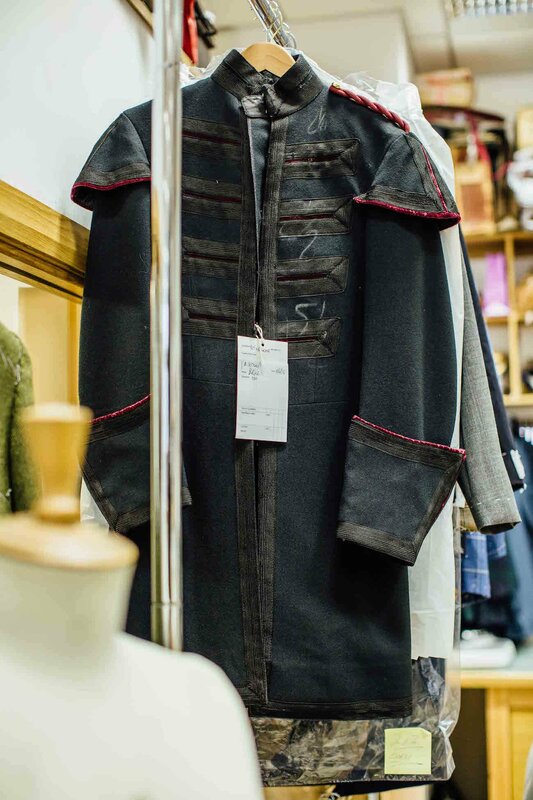 Apparently some Dege customers do apply them to their civilian tailoring: one recently ordered a frock coat with embroidery up the arms, to wear on his motorcycle. 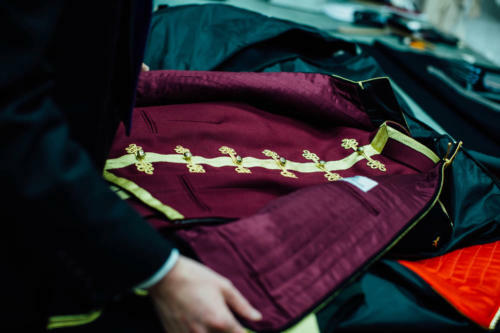 Below is a beautiful, rich purple mess jacket and vest of the Royal Hussars - similar in design to the Royal Lancers jacket but with that zip fastening up the back. And for some reason I am particularly taken by the big gauntlet cuffs on the Royal Company of Archers coat below it. Military tailoring still makes up about 30% of Dege’s work. They travel every week to Sandhurst to outfit new officers, and made the uniforms for then Prince William and Prince Harry when they were commissioned into the Blues & Royals. But it is shrinking. “Twenty years ago there were probably 22 regiments, now there are 8,” says De'Ath. The newly acquired workroom downstairs is bright and roomy, with just a few touches of personality starting to creep onto the walls around the apprentices and trouser makers. There is one apprentice working downstairs when I visit - Alex Hills, above in the green shirt, working on a series of sleeves. He is just finishing his apprenticeship but next to him is Cristian Greenwood, who is just one year in. You can follow the discussion on The style and tradition of Dege & Skinner by entering your email address in the box below. You will then receive an email every time a new comment is added. These will also contain a link to a page where you can stop the alerts, and remove all of your related data from the site. I love the look of the new website Simon. An excellent upgrade. Now I’m in even more danger of losing myself down this rabbit-hole. Why a single-breasted three button is more casual that a two buttons ? 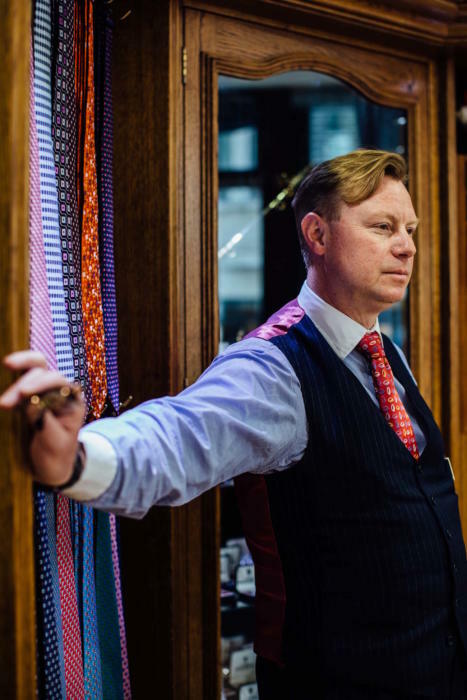 It’s a tendency rather than a rule, but for several reasons: you’re more buttoned up; it’s associated with country dress; the lapel line is less clean, straight and sharp. I’m very delight by this new design of PS, and even more so for having the opportunity to write my first comment ever on this new one! It’s cleaner and well balanced. Also a good idea for having featured Dege & Skinner in this first post! I enjoy reading it. Nb: Apparently, their RTW are not available on their website! Were there an explanation? Hi, I work at Dege & Skinner and we’ll be introducing the new RTW to the webstore within the next few weeks. News will be shared via the monthly customer email. Simon–do you have a preference as to 1, 2 or 3 button on a tweed jacket? Do you favor a longer gorge? I don’t particularly have a favourite for different cloths. More the makers. So I nearly always have 3-roll-2 from the Neapolitans because I like the way they do it. But I rarely have that from and English tailor. 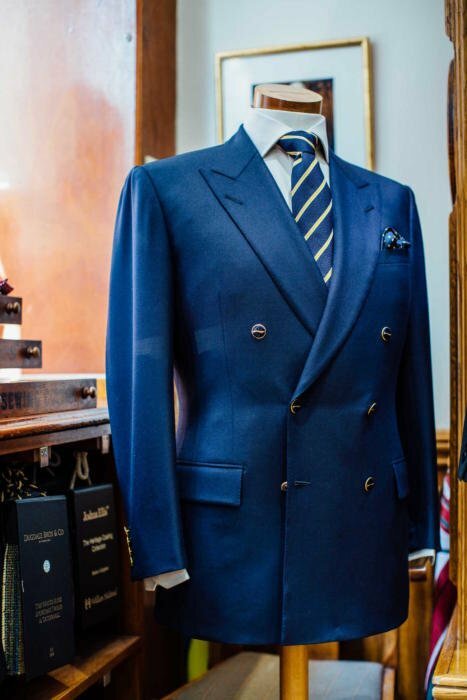 And I rarely have 1-button suits, but when I do it’s to make them a touch more formal or rakish. That said, I will tend to have 3 or 2 button fronts on casual jackets, which might be linen, cashmere or tweed. And no, I don’t vary the gorge for more casual jackets. 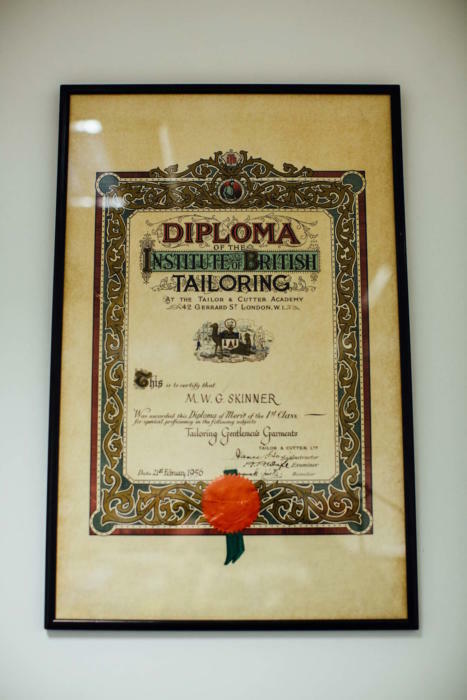 There is a tailor Colin De’Ath in Tunbridge Wells. Some relation, I would imagine? Yes, Nicholas’ father is indeed Colin De’Ath. 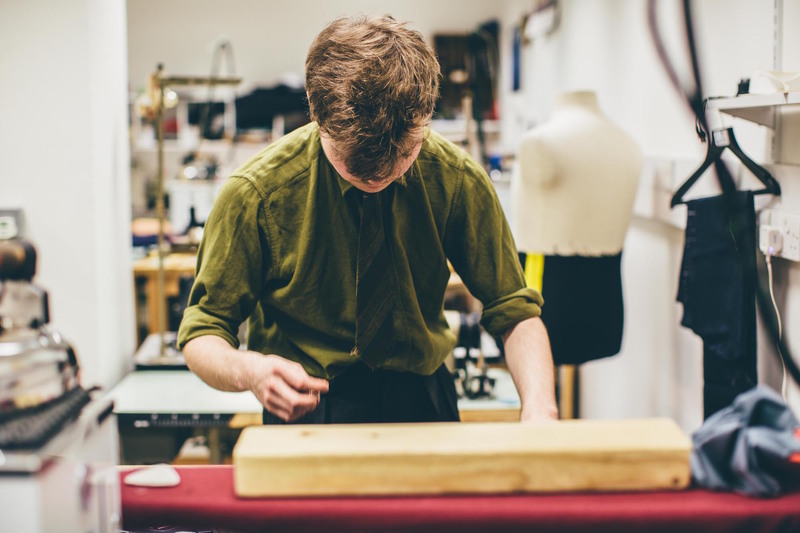 Nicholas followed his father into the trade to become a bespoke cutter. Lovely article Simon. The new website looks great. I really liked the end of the piece on the steps of apprenticeship. Any chance you will do a more detailed article on that process? Does the ready made offering have hand finishing as well (buttonholes, pick stitching, sleeve armhole)? Wensum haven’t offered a full canvas ready made suit for a long time so this is a a major milestone. I saw some at Aquascutum 15 years ago at 795 retail. Simon,this is,in theory, valid also for double breasteds? Double breasted suits are in the field of casual/sport or are formal? Or 4X2 are more casual and 2×2 (Kent) formal? By saying now there are only eight, one assumes he means eight line cavalry regiments. ? Woe to the scalpel of defence cuts! To the best of my knowledge, the Grenadier, Coldstream, Irish and Welsh Guards and both regiments of Household Cavalry all have Dege as an official tailor as well. Some other ‘smarter’ infantry regiments are also likely to.